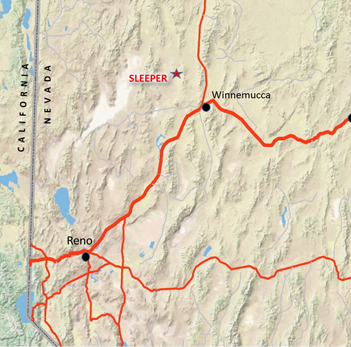 Paramount Gold Nevada owns a 100% interest in the Sleeper Gold Project, a former high-grade open pit gold producer located off a main highway approximately 25 miles northwest of the town of Winnemucca, Nevada. The famed Sleeper mine was operated by AMAX Gold Inc. (“Amax”) from 1986 until 1996, producing 1.66 million ounces of gold and 2.3 million ounces of silver. Paramount has assembled a district-scale project with significant unexplored gold potential. The project land position includes staked and purchased lands which brings the total holdings to approximately 60 square miles or 15,500 hectares stretching south on trend to Newmont’s Sandman Project. Amax’s mining operation left a legacy of superb infrastructure in place including excellent accessibility by all-weather roads to and within the property; electrical power (from the Nevada State grid); and water (two operating, deep water wells are located on the property). Paramount’s recent exploration and engineering programs at the Sleeper Gold Project confirm a very large, relatively low grade, surface resource of gold and silver which is bulk mineable at a low cost. A Preliminary Economic Assessment (“PEA”) conducted to examine the potential of operating Sleeper in a lower gold price environment with low capital and operational costs. The new study proposed a 30,000 tonne per day heap leach only operation with a low strip ratio and quick payback period of 3.5 years. In the current economic environment, the smaller footprint of the project significantly impacted the project economics, highlighted below, The PEA found significant reductions in both capital operating costs along with improved project grade and excellent recoveries which together produced an attractive bottom line (for PEA details click here). The PEA also considered an expanded operation in which the large inventory of non-leachable sulphide ore would be processed through a mill. This is an attractive option in a better metal price environment. The project’s extensive land holdings contain significant potential for discovery of new high grade deposits, similar to the one mined by Amax, on lands that have seen little modern exploration. These unexplored opportunities prompted Paramount to complete a helicopter magnetometry to assist in identifying new discoveries. A number of attractive targets emerged in this work. An expanded metallurgical testing program to verify and optimize metallurgical recovery for the various zones. This process would require a drill program to develop sample materials which would also convert additional Inferred mineralized material to Measured & Indicated. Ongoing environmental monitoring with the goal of starting the permitting processes related to re-opening the former operation. With the recent addition of the Grassy Mountain Gold project to Paramount’s asset portfolio, Paramount is focusing first on advancing the more economically robust Grassy Mountain Project with the commencement of a PFS. With its large resource base Sleeper provides Paramount with excellent leverage to the price of gold and represents an excellent opportunity in a rising gold price environment. The Paramount Nevada team is evaluating the advancement of Sleeper through to the completion of a PFS and assessing the potential of new geophysics programs, including helicopter magnetometry, to help identify high priority drill targets outside the main resource area. Paramount conducted its first exploration program at the Sleeper Gold mine in October 2010 consisting of 19 drill holes totalling 18,065 feet to verify data in existing models and confirm continuity and strike extensions of known mineralized zones. From July 1, 2011 through June 30, 2012, Paramount completed another 79 drill holes totalling 21,013 feet and followed that up in the period from July 1, 2012, through June 30, 2013 with a further 38 drill holes totalling 55,104 feet. In September 2011, Paramount announced the results of a new material estimate on the Sleeper Gold mine prepared by SRK Consulting (“SRK”). This estimate was conducted in accordance with the Canadian standards set forth in National Instrument 43-101. Based on the results of the report, the Company commissioned Scott E. Wilson Consulting Inc. (“SEWC”) to prepare a PEA for the project. The PEA was designed to evaluate both the technical and financial aspects of various production scenarios using the material estimate developed by SRK. In July 2012, Paramount announced the results of the PEA completed by SEWC on the Sleeper Gold mine property. SEWC concluded that the most attractive development scenario consists of a large-scale open pit mining operation with a heap leach processing plant handling both oxide and sulfide material, producing a gold-silver ore. The PEA assumed an 81,000 ton per day operation resulting in a projected 17-year operation with an average annual production of 172,000 ounces of gold and 263,000 ounces of silver. Paramount received the completed PEA report in September 2012. There can be no certainty that the scenarios or estimated economics in the PEA will be realized. In July 2012, Paramount announced the staking of 920 new lode mining claims (the “Mimi Project”) adjacent to the west and immediately south, of the Sleeper Gold mine. The Mimi Project totals 18,400 acres. In 2013, Paramount announced results of a drilling campaign which was focused in and around the existing resource and pit areas. Assay results extended the mineralization east and south of the existing resource, opened up new depth potential below the existing sleeper pit and intercepted exceptional results in several zones. Additionally, Paramount undertook an extensive database review and as a result, a total of 473 core and RC holes have been re-logged and new cross-sections were generated. Paramount completed a re-interpreted lithological and structural model to enable the Company to plan a new drill program and to update its mineralized material estimate model. In August 2014, Paramount dropped a total of 248 mining claims from its Sleeper Gold Project. These claims were determined to have no geological value to the Company. Build a new mineralized material estimate from the reinterpreted historical drilling and recently completed drill testing. Incorporate newly completed metallurgical testing which demonstrated excellent recovery for oxide and mixed ores and identified process options to enhance recovery for extensive sulfide ores left behind by previous operators. Re-assess the economic opportunity offered by the existing resources within the historical Sleeper Mine area. 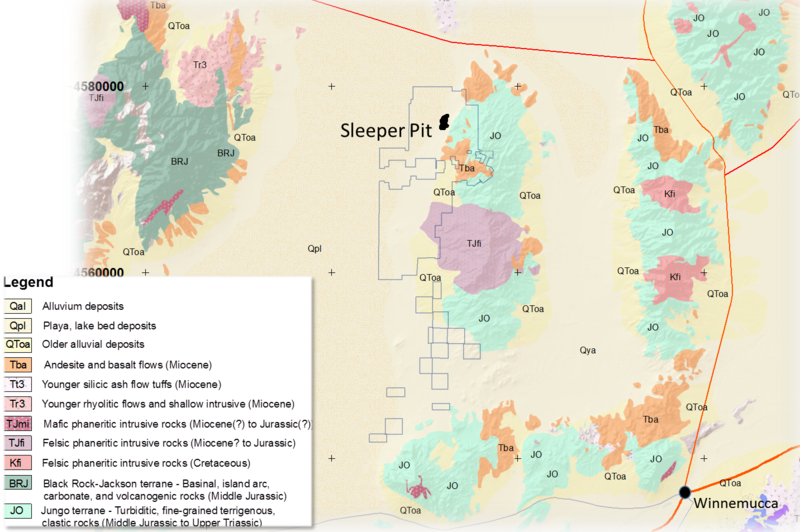 The Sleeper Gold Project is situated within the western part of the Northern Nevada Rift a geologic province of Miocene age that hosts several productive gold mining camps. The project is located along the western flank of the Slumbering Hills–a north trending mountain range bounded by faults. Faults on the flank of the range are north-northeast trending and drop the Paleozoic stratigraphy exposed in the range and the Miocene volcanic rocks down into the Desert Valley. These faults have accumulated down-throw of more than 1,000 meters and have focused hydrothermal gold-bearing fluids toward the surface. One of these favourable north-northeast trending faults controls the location of the Sleeper Gold deposit. Early – quartz-pyrite-marcasite stockwork propagating into the wall-rock around structures. Intermediate – medium-grade, silica-pyrite-marcasite cemented breccia in pipe-like or irregular bodies. Late – high-grade, banded, quartz-adularia-electrum (sericite) in narrow to very wide discrete veins. 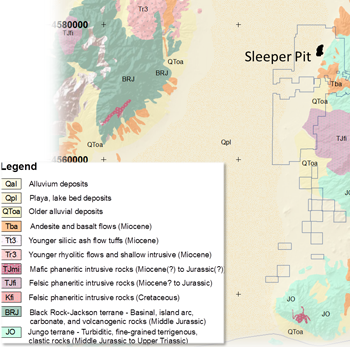 Post – alluvial gold-silver deposits in Pliocene gravels, localized in paleo-channels in dominantly unconsolidated material. 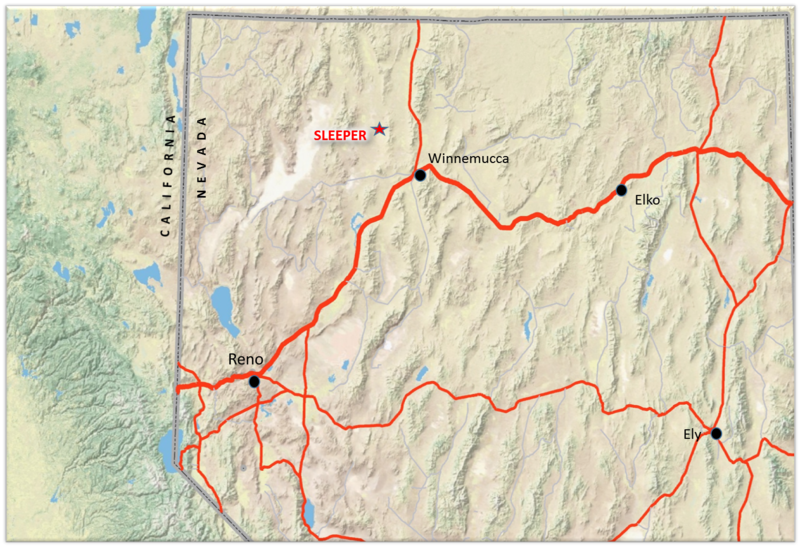 Within the Sleeper Gold Project all of these gold occurrences have been identified, but the intermediate and late stage mineralization are the styles that were exploited historically and brought notoriety to this Northern Nevada Gold Camp. These main stage mineralizing events are interpreted as a high sulfidation system, intimately associated with Miocene intrusive rocks and generated from magmatic fluids emanating from that source. In the extensive land package associated with the Sleeper Gold Project, two of the key components for the discovery of additional high-grade vein systems have therefore been established. These lands contain north-northeast trending faults to provide a trap for gold mineralization and Miocene igneous rocks, a source for gold-bearing fluids. 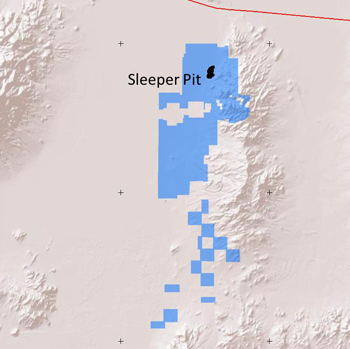 The mining district that contains the Sleeper Gold Project is constrained on the north end by the historical Sleeper mine and the extensive known resource and on the south end by Newmont’s Sandman deposit. Between these deposits, the north-northeast trending faults and Miocene igneous rocks are our focus with systematic direct and indirect exploration to find concentrations of high-grade gold.